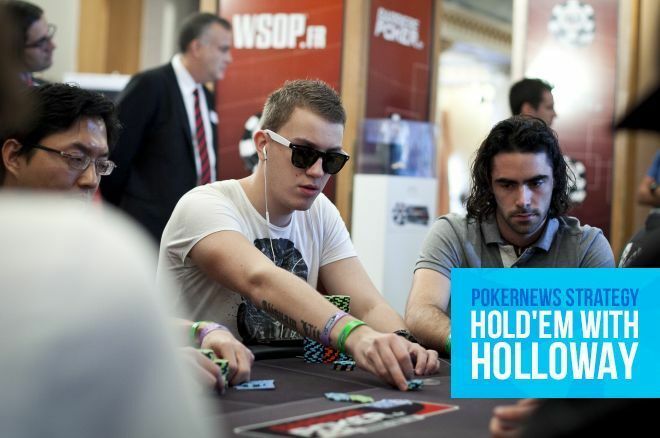 In Hold'em with Holloway, Roman "Romeopro33" Romanovskyi talks about his @888poker #XLEclipse win. This past Sunday, the 888poker XL Eclipse wrapped up with its $1,050 buy-in Event #32: $1,000,000 Main Event, which drew 710 runners who rebought 287 times. PokerNews was live reporting the action, and was there to cover what turned out to be a stacked final table including Rafael "nitGMmator" Moraes, Felipe "mr.salgado" Salgado, eventual runner-up Simon "Isildur1337x" Mattsson, and the man who bested him, Ukraine's Roman "Romeopro33" Romanovskyi. I actually have a professional relationship with Romanovskyi, having interviewed him several times in the past about his charity marathon. For those who don't know, in late 2016 Romanovskyi made the decision to donate 66.7 percent of his poker winnings to charity. Initially, Romanovskyi hoped to win $600K so he could donate $400K. His charity marathon is now up to $1.1 million. Sunday's win marked the third time Romanovskyi has captured an XL Eclipse title. Last year, he won the $109 buy-in Event #27: $15,000 Tornado for $5,332 and then a day after that took down the $2,100 buy-in Event #36: $500,000 High Roller for $107,500. Romanovskyi is an all-around online beast, but he shines particularly well in the XL Eclipse. I had to find out why and chat with him about his journey to victory. Fortunately, Romanovskyi was willing to jump on a Skype call to talk about some big spots. In one hand that stuck out in his mind, Romanovskyi recalled limping from the small blind with and calling when an opponent shoved 20-something bigs from the big blind holding . Romanovskyi lost the flip. Romanovskyi: "I didn't play too well in my opinion, I just generally ran better." "It's probably not that good of a shove," Romanovskyi reflected. "He'd be better off shoving king-deuce, but it doesn't matter that much. As long as you still have chips and are among the middle of the pack, it really doesn't matter. Having even one chip is all it takes. It's always possible to win." "It hurts sometimes when you're chip leader, lose a flip, and have like 10 big blinds," Romanovskyi continued. "Even though it doesn't matter in terms that you could still win the tournament, it does matter when it comes to the odds and probability that you're going to win it. If you have one ante you have a much lower chance of winning than if you have a chip leader stack." Remember, Romanovskyi and Mattsson squared off in heads-up play, which lasted nearly three full blind levels. Mattsson was the chip leader for most of the final table and scored most of the eliminations, while Romanovskyi played patiently, laddered up, and waited to make his move. "After the flip, I won like five or six all-ins while Simon was busting everyone from the final table," said Romanovskyi. "I just managed to hold until heads-up. I was playing relatively tight. In the end, his last shove with queen-eight was pretty bad against a limp 20 BB deep. A check is much better. I had aces. Other than that, he played okay. I didn't play too well in my opinion, I just generally ran better." Romanovskyi summed it all up, saying "He made maybe one or two significant mistakes, and I probably did too I guess. We both didn't play too well, it was due mainly to the fact that I just ran better." Whether it was playing well, running well, or a mix of both, Romanovskyi is the 2018 XL Eclipse Main Event champion. He earned $187,500 for the victory, two-thirds of which will be donated to charity.